The Scottish architects Burnet, Tait & Lorne were regarded as the premier British architectural practice of the decade of the 1930s. 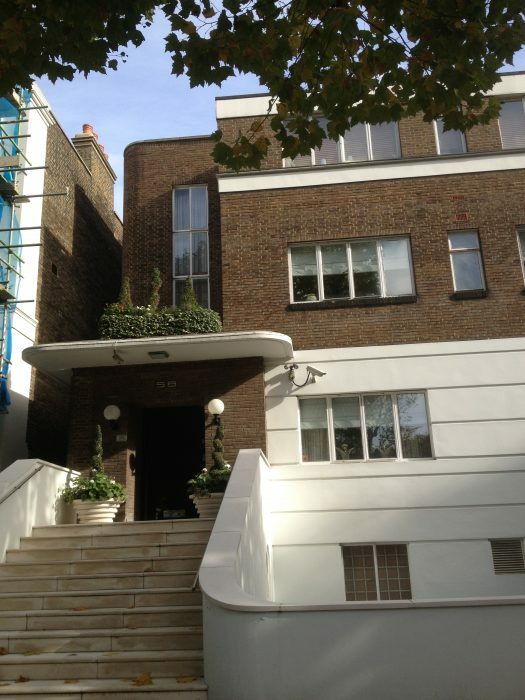 In St John’s Wood, they were commissioned by the Marques and Marquesa de Casa Maury, in 1937, to build them a house at 58 Hamilton Terrace. The Marques had already used this firm of architects when he built the Curzon cinema in Mayfair and also for the terrace of houses in the Art Deco Moderne style in Wells Rise, off Prince Albert Road. In The Modern House Revisited (published by the 20C Society in 1996) these houses are dated 1934–1936, but an owner/resident informs us that his house was registered with the Land Registry in 1926. This page was added on 21/09/2012.